The Chem at Work edition of Sage Enterprise Management (formerly known as Sage X3 ERP) provides regulation management functionality for the ever-changing regulatory landscape of the global chemical distribution & manufacturing industries. The management, tracking, and reporting of chemical inventories is a requirement for companies that manufacture, store, label, ship, distribute, or handle controlled substances and hazardous materials. 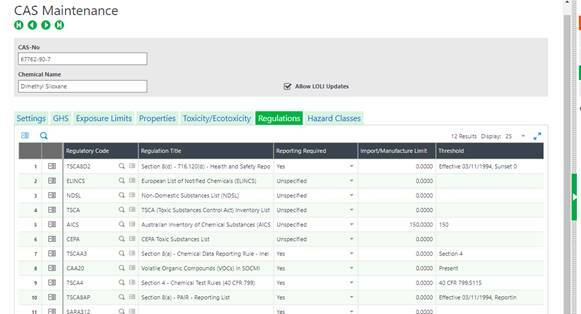 In this post we describe how Chem at Work, the Chemical ERP for Sage Enterprise Management helps you manage the regulations, and report to the governing bodies as required by the chemical industry business processes and commitments. Chem at Work comes standard with 70 pre-loaded regulations and allows for you to track as many more regulations as your specific industry requires. Once defined, regulations may be assigned to CAS numbers, products and/or Safety Data Sheets. The Import/Manufacture Limit – the inventory receipt limit for a chemical, based upon the country’s inventory list. Reporting Quantity (RQ) Threshold – The maximum daily weight reporting threshold for the regulation. These limits can be further defined on the CAS Master Regulations tab for a specific chemical. Reporting Required/On List – Defines the regulation default of whether the regulation prints as “required” or “on list” on the SDS report. Inventory List – Inventory list regulations are regulations listed on a specific country’s list of toxic chemicals. Regulations that are defined as inventory lists are automatically added to each CAS record that is created. LOLI data for clients that are integrated with a LOLI service. The maintenance then requires specification of which CAS numbers fall beneath which regulations. This is manually created & maintained unless your Chem at Work system is integrated with a 3rd party application or service – a user is also free to add to the list of regulations w/in CAS maintenance screen. The last step in maintaining the regulations is to specify which CAS numbers associate with each product. Here again Chem at Work provides for either manual maintenance or automated updates via 3rd party authoring tools like Hazox, ERA, Verisk 3E, or any others with APIs or ODBC connections. The regulations will load to the product based on CAS assignment and may also be loaded individually on the product record. 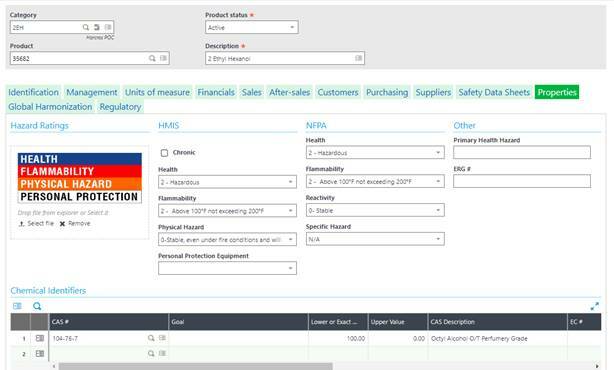 The Chem at Work Sage Enterprise Management Chemicals Regulation Reporting feature calculates weight totals received, present or manufactured during a definable period and for chemicals approaching or exceeding a limit imposed by a regulation. These limits may be imposed by the chemical inventory lists of the country where the company is located, or community notification rules based upon storage amounts. If a company has locations in multiple countries, each site may have different requirements. Examples of regulations with a manufacture or import limit are U.S. TSCA or the Canadian Domestic or Non-Domestic Substances List. An example of a regulation with a reporting requirement based on the storage amount is the U.S. Community Right to Know Act, commonly known as SARA. This module is not intended to replace or eliminate the need for companies to file the regulatory reports in the formats required — it is used to provide all the supporting data to streamline form completion. This feature uses the concept of a reporting sessions for the retrieval and capture of the regulatory data. A reporting session is a record that stores the results for each regulatory calculation. With definable filters, such as site, warehouse, CAS# or date, a reporting session calculates and saves results for future reference. Calculations are performed and reported for both products and CAS records based on site, date range, and several other optional criteria. System data for each CAS# is validated against the threshold and import/manufacture limits for each regulation defined on the CAS master record. If the CAS total exceeds the threshold % or the import/manufacture limit % that is defined, then the results are presented with the product that contributed the most to the violation of the limit(s) indicated as well. The session may also be established to return values for indicated CAS#s that are approaching a regulatory threshold or limit, in this manner, business decisions may be made to slow procurement or perhaps delay production campaigns. When a user updates the Regulation Library with a new entry or modifies an existing regulation, they may run an update utility to push that update to CAS, SDS and/or Product records. For more information on regulatory maintenance and reporting in Chem at Work’s Sage Enterprise Management, please contact us. Additionally, the Chem at Work ERP for Chemical edition of Sage Enterprise Management (Sage X3) for Chemical has addressed other unique business requirements of the chemical manufacturing and distribution industry.